Democratic Gov. John Bel Edwards is seeking to scale back the Louisiana Scholarship Program, the latest attack against the school choice initiative that enabled more than 7,000 low-income children to attend higher-performing schools this year. Advocates of school vouchers are pushing back against Edwards’ plans to reduce the number of students eligible for the program and authorize a $6 million cut, which they say is the equivalent of 1,000 scholarships for students. School vouchers have been under constant fire from teachers unions and Democrats since the program began in 2008. The Obama administration sued the state over the program, an effort that ultimately failed. Former Gov. Bobby Jindal was a strong supporter of the program, which provides vouchers through a lottery for students to attend private or charter schools and leave low-performing schools with ratings of "C," "D," or "F." With Edwards assuming office and facing a massive budget shortfall, the program is back on the chopping block. 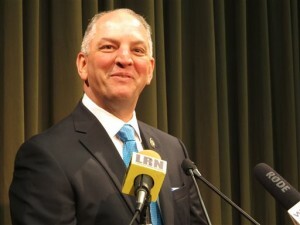 Edwards proposed a $6 million cut to school vouchers, amounting to 14 percent of the program. The move is backed by the Louisiana Federation of Teachers, who says it is fair because cuts also hit public schools. However, public education would only receive a 1 percent cut in the governor’s executive budget. Edwards promised during his election campaign that he was "not going to end the voucher program." Now, along with the proposed cut, Edwards is seeking to eliminate the option for students to flee "C"-rated schools, saying those schools are "by definition, not failing." The Louisiana Federation for Children, a leading school choice advocacy group in the state, is blasting Edwards’s plan. The group launched an ad campaign featuring mothers of children who have received vouchers that say Edwards misled them on his intentions for the program. "He lied to me. He lied to my child," one says. Louisiana Federation for Children President Ann Duplessis told the Washington Free Beacon that a $6 million cut to the program would cost 1,000 low-income children their scholarships. "It really is a very upsetting," said Duplessis, a Democrat and former member of the state senate. "We have been looked at as the model for reform and choice in Louisiana, we believe that these options are vital for our families." "Families that are able to have vouchers are even more upset and stressed over this lack of concern about their children’s welfare," she said. "We have over 7,000 children who are currently in the program, whose families and parents have come out strong and said we want this to continue." Duplessis said it is "very possible that vouchers could be taken away." Six million dollars is the equivalent of 1,082 vouchers for students, which average $5,545 each. Duplessis said the program needs $47 million to accommodate kids who are currently in enrolled plus 500 additional families who applied and got approved for vouchers this year. "[Edwards] wants $36 million. Roughly a little over 1,000 children will lose their scholarship," she said. "That is unacceptable." Edwards flatly denied during a press conference Thursday that participating students would lose their vouchers. "No student currently receiving a voucher will lose it," Edwards said. "I have consistently said that I was not going to end the voucher program, nor would I propose taking away vouchers from students who already received them. I have been good to that word." Edwards said that the amount per voucher would have to be decreased, and private schools would have to accept less for each scholarship due to the cut. He also said the voucher program has been "over-appropriated" from the beginning, and blamed "outside groups" for misleading the public on the issue. Richard Carbo, a spokesperson for Edwards, reiterated the governor’s remarks, telling the Free Beacon that Edwards entered office facing a $2 billion deficit, and is required by law to present a balanced budget to the legislature. Edwards was forced to present many cuts that "he certainly doesn’t want to be implemented," he said. "It is an outright lie, current students will not lose their vouchers," Carbo said. "Even with the $6 million cut we will continue to have the voucher program," Carbo added. "There is no one that is being cut. [The Louisiana Federation for Children] are running this ad, they did no work during the special session to encourage the legislature to work with the governor on funding these programs." Duplessis is still concerned students could lose their scholarships, the vast majority of which are African-American. She said it would cost Louisiana more if students were cut from the program, as public schools would have to accommodate hundreds of kids into their system. A University of Arkansas study recently found a connection between voucher programs and lower crime rates. In the past, the school has found that voucher use increases college attendance and saves state taxpayers millions of dollars. "The thing that is so stressing for our families, it’s the families, it’s the parents, it's the children who are being directly harmed," Duplessis said. "[Edwards] said throughout the campaign that he was not going to hurt the program, he wanted to tweak it, kids were not going to be removed from the program." "But when you cut it so significantly you have the absolute affect of kids being harmed, kids being removed from the program," she said. "We were hopeful that we would be able to continue to grow the program. But with the constant badgering of the program, and uncertainty, they’re quietly trying to kill it." Former Attorney General Eric Holder brought the full force of the Justice Department against the program in 2013, seeking a permanent injunction against it and attempting to put vouchers in the hands of federal judges. A federal court sided with Louisiana in the case in April 2014 and did not grant the DOJ’s request to be able to deny vouchers on an individual basis. Despite the attacks, the program is popular and is growing, with 13,000 families applying last year. A 2015 report from the Louisiana Department of Education found that students participating in the scholarship "outpaced Louisiana’s statewide public school average" in student achievement gains. Duplessis said that after Katrina, kids in New Orleans were exposed to better schools in other states, which led to education reform. "Our families saw another way," she said. "It’s kind of like, ‘I’ve seen the mountaintop and I’m not going down.’ It took so long for families to come back, especially those with young children they were now in a position where their children were getting the best education." "It’s a different world here, our families are not tolerating at all the same old, same old," Duplessis said. "We simply are giving them a voice. The most at-risk families who don’t have the resources, not connected politically or socially. But we grab all of those voices and say, ‘You know what? We’re going to give you a platform to give this administration and legislature what you want.’"